Motion blur on the Atari 2600? This might seem like an impossible proposition, but I have written a soft blitter chip capable of outputting 30 and 60 FPS of full screen animation on the Atari 2600. I also created a BASIC to harness the soft blitter, making it easy for anyone to do research and experiments with animation and motion blur reduction. These experiments are possible because the Atari 2600 has a nonstandard video signal that is not interlaced, rather than putting out 60 fields per second it outputs 60 full frames (240p) on a classic tube Television. Some Atari emulators like Javatari can reproduce this effect on the PC fairly well, though a classic console connected to a tube television is best for experiencing the full cumulative rendering effects of phosphor persistence and artifact colors also present in these experiments. (Note that an LCD monitor connected to a classic Atari console may merge frames, improperly rendering the output as 240i instead of 240p which prevents viewing these experiments). STARBLITZ - a fast action Defender style game for the Atari 2600 where you save the cities of Mars from comets and meteors while fighting off aliens and surface to air missiles and catching score power-ups to advance to the next wave. When the game loads you will see really fluid animation on the title screen, press the button to start a game and see the smoothly scrolling cityscape. Now you can use the BW switch (it's in the lower left on Javatari) to switch between 30 and 60 HZ; the game stays at 30 FPS so at 60 HZ the frame is doubled creating a blurry effect with visual artifacts that exist only on your retina. Because of the full screen animation the motion blur reduction is readily apparent and makes the game more fun to play, an old-school CRT Television maximises this effect further because of the phosphor persistence and artifact colors. Press the button to start the game, then you can use the BW switch to turn on the WARP engines, speeding up the action to 60 FPS and eliminating the motion blur, the effects are readily apparent. KC Monster Maze - Ed Averett's classic KC Munchkin for the Oddyssey II ported as a panoramic scroller to the Atari! Note that the game features cooperative play with the CPU - the AI takes over if you hesitate to turn, very different than what we are used to. Hope researchers are ecouraged to experiment with motion blur reduction on the Atari 2600 and to create fun games! One modification to test is to test with a Blur Reduction Display such as NVIDIA ULMB found in a G-SYNC monitor, combined with the ULMB 60Hz hack. 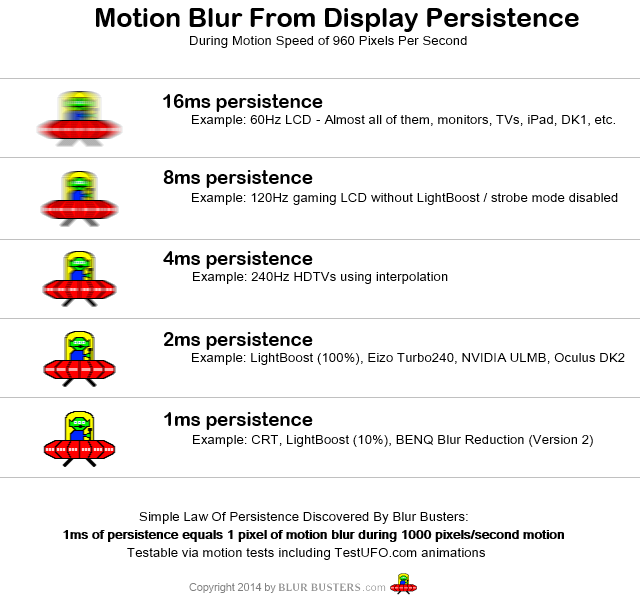 Mathematically, Blur Busters Law is "1ms of persistence = 1 pixel of motion blurring per 1000 pixels/sec" but display blur reduction algorithms can also statistically affect the results. You can read about it in the Blur Busters Law: The Amazing Journey To 1000Hz Displays -- which helps explains the universal law of mathematics of display motion blur, of persistence, and of display motion blur reduction (independent of software) -- which is an article we wrote after we were the world's first website to publish mainstream tests of an experimental 480Hz monitor -- and it validates the display motion blur math very well. 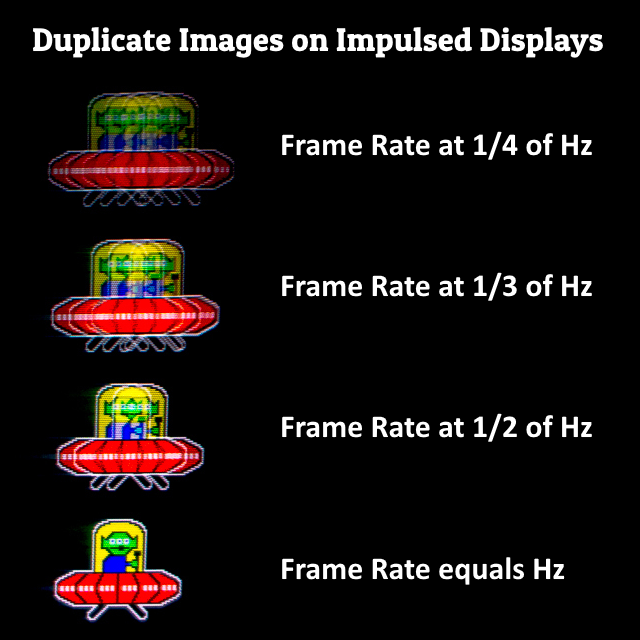 60fps strobed = double image effect (60fps@120Hz has similar effect as 30fps@60Hz CRT), see diagram from my 1000Hz article. Regardless, blur reduction modes on high end gaming displays have a huge effect in affecting the results. While hardware-based black frame insertion (e.g. backlight flashing) can illuminate a refresh cycle at briefer than the length of a refresh cycle, allowing motion blur to be reduced even further. What this means is that the results certainly changes in different ways when combining it with hardware based blacklight flashing (for blur reduction). So tests could be repeated on a display with blur reduction capabilities. Chief Blur Buster wrote: Welcome!!! I just read the Amazing Journey to 1000Hz Displays and the experimental 480Hz CRT - really fascinating research! From the 2013 persistence chart from your intial research I see the LCD is holding the backlight on for the entire frame duration - 1/60th of a second for 60 HZ LCD, 1/120th of a second for 120 HZ LCD, etc. I imagine with a plasma display persistance would fade compared to steady state on the LCD though would not match the phosphor persistance fade of CRT. I would also bet that 480HZ CRT has to have phosphor that's formulated for much lower persistance than the old-school tube Televisions designed for 30 FPS. Gamers noticed the fluid animation unusual for an Atari 2600 game but there were some requests to make the game run at 60 FPS which I was able to achieve optimizing the soft blitter code. Comparing both versions led me to similar observations on the effect of the black frames and of motion blur flicker being another type of flicker that other Atari programmers were not aware of for not having written 30 FPS full motion Atari games made possible by the blitter. This led in turn to some additional experiments I think you will find interesting and all very Area-51 appropriate; since I could not go above 60 HZ on the Atari's open architecture my next set of experiments were similarly related but went in the other direction. I remember seeing the Hobit at 60 FPS and not liking how real it looked; movies always had a surreal quality at half that frame rate, the brain fills in the details and perhaps we percieve more of what we want to see. From the black frame insertion experiment it was clear matching the HZ to the FPS removed the motion blur. It w as also clear the remaining 30HZ flicker effect was pleasantly on the border of flicker perception (enhanced by using blue, other colors were less pleasant at 30HZ). What would happen if I kept on dividing and reducing the HZ while keeping the FPS matching in synch? The results were really interesting, super smooth animation at what turned increasingly into an audio-visual strobe experience; in addition to the soft blitter chip I had written a tracker/sequencer that shapes the evelopes of the sounds - I tied both to the divisor creating an immersive variable rate audio visual experience playable in the following refresh rates shown in the manual exerpt. Playing the game for a few minutes at 7.5 HZ and still seeing super smooth animation in a darkened room lit only by CRT yielded some illustrative tactile insight into the surreal effects I was aware of being reduced but couldn't fully articulate when comparing watching the Hobit at 60 FPS to a similar fantasy genre theater experience at half the frame rate. Glad to be on this forum, all of the research and the threads are fascinating, I'll be reading for days! It's not a 480Hz CRT -- it's a 480Hz LCD. Yes, you heard me right. An LCD successfully refreshing pixels 480 times a second. Persistence of plasma phosphor is about 2-3ms. That's much worse than CRT. However, that's not the only thing, it often pulsed subfields (a form of temporal dithering too) many times per refresh cycle. So the 600Hz simply increased persistence in many cases, rather than decreased it -- and often added multi-image artifacts as well as countouring. Yes, plasma used to be better than LCD of its era, but several modern LCD with strobe backlights or FALD-scanning backlights, have already surpassed plasma's blur-reduction capabilities. Yes, you have to pay out of the nose to erase 90% of LCD motion blur -- i.e. expensive gaming monitors -- or expensive televisions -- but today many LCDs have less motion blur than plasma. It doesn't work on plasma. The display hack simply configures the LCD strobe backlight to flash at a 60Hz frequency because manufacturers artificially limit the minimum flicker frequency to no less than 100 or 120 Hertz due to flicker concerns. This makes scientifically correct blur-reduction at 60fps @ 60Hz impossible. There's no lower limit to how brief a backlight can be flashed. But you cannot shorten a plasma display's long-persistence phosphor and its multi-pulsing behaviour (which causes countouring and PWM-like effects, unless motion-compensated on some of the more extra plasmas). So the ULMB 60Hz hack is non-applicable. Normally I can read the TestUFO street name labels at 960 pixels/sec on my ULMB display only at supported ULMB refresh rates (e.g. 100Hz or 120Hz). Just like on a CRT, the street map is equally readable on my LCD as on my CRT. But as soon as I switch to 60Hz, the backlight automatically ceases its blur-reduction flicker mode, and all the nasty motion blur comes back, and behaves as badly as an ordinary DELL 60Hz LCD or iPad 60Hz display or whatever. Smeary, blurry mess -- I cannot read the map labels. And 60Hz is useless for fast platformers -- it becomes too much of a motion-blurring mess. And forget about 30Hz, even worse, twice as much motion blur as LCD-blurry 60Hz. Now, if I do the ULMB 60Hz hack to bypass the arbitrary manufacturer restriction on flashing a backlight at a lower frequency, this is what happens: I can read the TestUFO street name labels even though TestUFO is running at 60Hz! Yay. It flickers more, sometimes uncomfortably to my eyes (not everyone can handle 60Hz CRTs either -- especially since our computer monitors are bigger and brighter than CRTs in the past -- amplifying flicker). But I can read the labels! Just like a CRT! And if I adjust "ULMB Pulse Width" I can make text even clearer, display motion blur is fully controlled by strobe flash length (motion blur now successfully largely decoupled from pixel response speed, see below for technical explanation why). So here is, sitting LCDs on my desk with 98% less motion blur than your iPad, iPhone, or Dell computer monitor. Hundreds of brands of these LCDs now exist (probably unbeknownst to you) for motion-blur-picky people. The problem is they behave like "120Hz CRTs" without a 60Hz blur-reducing mode, which is why the ULMB 60Hz hack exists. Imagine my LightBoost/ULMB gaming LCD automatically behaving like a CRT only when the refresh rate is high enough. Normally the blur comes back everytime I switch back to 60Hz because manufacturers don't like to be liable for flicker. One thing to keep in mind, ULMB in GSYNC monitors have a software DRM-like feature that forces ULMB to work only when connected to an NVIDIA graphics card. While nothing technically stops ULMB 60Hz from working with an external Atari 2600, it's a firmware restriction afforded to NVIDIA graphics card users. So you have to look at different strobe backlight brands (e.g. BenQ) such as the BenQ XL2720Z which is successfully able to single-strobe 60Hz with an external HDMI input, such as a Playstation or XBox (or even an Atari 2600 being adaptored through a device such as HDFury). I have already seen LCDs with less motion blur than a CRT. Including the 480Hz LCD that I tested. It's all in adjusting strobe flash length -- flashing a backlight briefer reduces motion blur -- see LightBoost 10% vs 50% vs 100% which also applies to the "ULMB Pulse Width" on-screen-menu adjustment (backlight flash length per refresh cycle for blur reduction modes). On some of my monitors I can adjust the strobe pulse width to only 0.25ms -- which creates an LCD that has less motion blur than an average CRT. The only problem with that is because the backlight is flashed so briefly, the picture is often dim. So displays need to have a lot of backlight overvoltage boosting to flash brighter to compensate for briefer flashes. High speed videos of CRTs show that the electron gun dot can sometimes shine north of 100,000 nits for a brief instant, to compensate for the large black period between illuminations of a pixel. You need double the brightness for half flash length, to maintain the same average brightness. That is a high speed video of http://www.testufo.com/flicker which alternates black/white frames every other refresh cycle. You can then recognize how an LCD refreshes a panel top-to-bottom with a GtG fade zone. When 99% of the GtG fits inside the black period, only 1% leaks into the illumnated period and manifests itself as faint strobe crosstalk. This was how 3D LCDs pulled it off -- they refreshed so cleanly that the next frame was fully displayed by the time a 3D shutter glasses switched shutters. Because 3D forced LCDs to become so fast, it turned the tables on motion blur: The motion blur limiting factor fully ceased to be pixel response's fault. Now it was possible to eliminate the lower floor of the minimum possible motion blur achievable by an LCD -- simply by merely increasingly briefer-and-briefer flashes of fully-refreshed refresh cycles of an LCD (as seen in the high speed video example). So the minimum motion blur floor of an LCD just dropped off the bottom of the pail, and there's no lower limit anymore as long as the majority of GtG is kept in dark. This was made possible ever since GtG became a very tiny fraction of refresh cycles. Now it is possible to break the pixel response barrier because GtG can occur in total darkness, while persistence occurs with backlight turned on. GtG can be longer than persistence, yet motion blur matches persistence (seen by eyes) while GtG stays in the dark (unseen by eyes). As long as it fits within a refresh cycle (GtG in dark period, persistence in bright period). And with that, there's no longer any lower limit to the minimum possible motion blur achievable on an LCD -- as long as pixel response is fast enough to fit virtually completely inside the dark period of a refresh cycle. GtG is never perfect, but it can be made practically ~99% perfect on some panels -- they had to, for 3D shutter glasses, anyway. That made the strobe-backlight blur-reducing mode very practical, and was a godsend for a lot of us CRT lovers in the last few years. So, currently, my gaming monitors blows away plasma in having less motion blur than plasma displays -- that is what LightBoost made possible and is now widely found as part of ULMB (included in G-SYNC monitors). The blacks are not as good as CRT obviously, and you do get a large brightness loss during blur reduction mode, but motion blur is no longer an LCD problem anymore. As you have already noticed I have worked with a few monitor manufacturers in improving blur reduction features, whether it's advanced content such as Electronics Hacking: Creating a Blur Reduction Backlight for LCD, or the Blur Busters Strobe Utility for BenQ/Zowie, or helping Zisworks with his 4K 120Hz LCD with its bonus 480Hz mode. And obviously, our monitor-tests testing inventions. Chief Blur Buster wrote: The display hack simply configures the LCD strobe backlight to flash at a 60Hz frequency because manufacturers artificially limit the minimum flicker frequency to no less than 100 or 120 Hertz due to flicker concerns. This makes scientifically correct blur-reduction at 60fps @ 60Hz impossible. So with the hack a 240 Hz LCD playing 60 FPS footage is still rendering 4 frames per second but only being illuminated by the strobe backlight for 1/60 of a second instead? Interesting... then software blur reduction for emulators rending 60 FPS games on the experimental 480 Hz LCD would effectively divide the pulse width by 8 by throwing 7 black frames in a row creating near zero motion blur? Same way we take 60 FPS at 120 HZ and 30 FPS at 60 HZ games and effectively cut the pulse width in half inserting one blank frame. Something interesting about pulse width is that we perceive n doubled frames as one long pulse width even if the individual pulse widths are vey short. WARPDRIVE's opening screen has a similar motion blur text example as the testUFO street labels, the BW switch toggles the scrolling text between 30 HZ at 30 FPS and 60 HZ at 30 FPS. The pulse width seems to span the duration of n duplicated Hz frames creating much longer pulse rates for the actual frames of animation. My understanding so far is that when the manufacturers adds the ability to reduce the pulse width on LCD's that feature can help a 120 Hz LCD display 120 FPS of animation with less motion blur but it cannot help it to reduce 60 FPS motion blur from doubled frames. And that you also work with these manufacturers to build a hardware strobe model that can black out every other frame to eliminate 60 FPS motion blur by running the backlight at 60 Hz to allow only one visible pulse (not two) every 60th of a second. No, it's 60 refresh cycles per second with 60 flashes per second. It's a hardware-only display hack, although hardware BFI and software BFI can be combined (a completely different topic altogether than the ULMB 60 Hz Hack, which is a 100% pure hardware-only single-strobe hack). Read that link, it's useful knowledge anyway. The fact that the monitor is 240Hz is just happenstance/incidential to the ULMB 60 Hz Hack. Theoretically a very good 60Hz monitor could have the ULMB 60Hz mode, but no monitor manufactures does it. We have to buy a 240Hz monitor to get easy CRT-clarity 60Hz mode, you see? Meaning, CRT-like "60Hz" LCDs usually requires you to pay a "high Hz" premium. On top of it, there's essentially a DRM protocol (Digital Rights Management) on NVIDIA GSYNC displays preventing the mode on AMD cards. It's essentially a 2-way communications on the DDC/CI (i2c) channel on the video cable actually verifying that the monitor is connected to an NVIDIA graphics card, before the monitor allows certain features to enable itself. Which means the CRT mode doesn't enable itself when you connect the monitor to an AMD card. Even though nothing technologically stops doing ULMB 60Hz on a 60Hz monitor connected to an AMD card. So to get the beauty of a ULMB 60Hz hack for emulator-use-only, you pay a high-Hz premium and you have to go NVIDIA, to get a 60Hz CRT-motion-clarity LCD monitor. Mr SQL wrote: Interesting... then software blur reduction for emulators rending 60 FPS games on the experimental 480 Hz LCD would effectively divide the pulse width by 8 by throwing 7 black frames in a row creating near zero motion blur? Same way we take 60 FPS at 120 HZ and 30 FPS at 60 HZ games and effectively cut the pulse width in half inserting one blank frame. Yes, that is an option. But you can also simply use the backlight to do that instead, too. Basically a 60Hz monitor that flashes the monitor only 1/8 of the time. To the human eye, it can essentially be the same effect. (It's more engineering-complex than that behind the scenes, but essentially, you get the idea). However, ULMB is adjustable persistence, via adjustable strobe length, and the ranges vary from manufacturer to manufacturer. Usually the range is roughly 0.25ms persistence to 2ms persistence. When you see "1ms MPRT" that means a strobe backlight (MPRT = persistence = true motion blur measurement). This is true at any Hz. 60fps 1ms strobed (once per 60fps frame) at 60Hz, 120Hz, 240Hz, 480Hz, would all have exactly the same blur. That's why CRT didn't vary much in motion blur when refresh rate went up and down. The persistence of the phosphor was essentially unchanged. Likewise, for LCD strobe backlights, the motion blur is controlled by strobe length, and not by refresh rate. - Motion blur is pixel visibility time. - Reducing motion blur is by shortening pixel visibility time. You can see this very educational animation in a stutter-free web browser. 4 UFOs plus a bonus UFO. This explains this in one simple, single glance. So you are noticing that 15fps is generating 67 pixels of motion blurring at 1000 pixels/second. (That's why TestUFO runs at 960 pixels per second -- it's close to 1000 pixels/second while being evenly divisible by 60, 120, 240 and 480 -- and makes interpretation of the Blur Busters Law mathematics easy). If you test this TestUFO animation on a 120Hz display, it will be 30fps (at half persistence numbers above). If you test this TestUFO animation on a 240Hz display, it will be 60fps (at quarter persistence numbers). Now, instead of doing this at the software level, we can instead do it at the hardware level instead by simply turning of the backlight. And the bonus of using the backlight is that we can do it for less than a refresh cycle. Which means overkill refresh rate is not essential. To get 0.25ms persistence without hardware strobing, would require a 4000Hz display. To get 1ms persistence without hardware strobing, would require a 1000Hz display. So that's why hardware strobing can be superior to software-based black frame insertion. Mr SQL wrote: My understanding so far is that when the manufacturers adds the ability to reduce the pulse width on LCD's that feature can help a 120 Hz LCD display 120 FPS of animation with less motion blur but it cannot help it to reduce 60 FPS motion blur from doubled frames. And that you also work with these manufacturers to build a hardware strobe model that can black out every other frame to eliminate 60 FPS motion blur by running the backlight at 60 Hz to allow only one visible pulse (not two) every 60th of a second. It's only because of a arbitrary manufacturer limitation. True 60Hz strobing (60Hz CRT clarity LCDs) is much easier than 120Hz strobing, ironically! But it's not available easily on the market without hacks or huge premiums. (A) From a desktop computer monitor perspective, strobing was originally engineered for 3D Vision (see the old LightBoost FAQ from year 2012, but it was found to have shockingly huge motion blur reduction benefits, so now that is the most popular purpose of strobing. (B) 120Hz means 60Hz per eye. The monitor displays 120 refreshes per second, while the shutter glasses switch frames. So you see, strobe backlights were engineered first for 3D, before they were made popular as a motion blur reduction feature. The 120Hz strobe standard stuck. Metaphorically, it simply means we've been given the equivalent of 120Hz fixed-frequency CRTs that can't do 60Hz -- quite inconvenient if you want emulators. You see? (C) Manufacturers are leery of flicker. Lawsuits. Epilepsy. People hated 60Hz CRT flicker. So they artificially limit firmwares to not strobe at a lower frequency. It's easier to technologically bypass LCD GtG via 60Hz strobing than via 120Hz strobing. But many simply don't. Unless we do hacks. So voilà (A) + (B) + (C) + (D) combined equals the exact reason why we have to jump through lots of hoops (financially & programming wise) to get a 60 Hz CRT clarity LCD which is otherwise super-dirt-easy nowadays with today's TN technology. Hackers and hobbyists have modified LCDs to strobe already, sometimes doing as good a job as a manufacturer's strobe mode. So I think you now better understand better the situation? It is exactly why 60Hz hardware strobing is not common or easy. -- Or use an undocumented hack to force a ULMB monitor to strobe at 60 Hertz while running a 60 Hertz refresh rate. So it's basically a "choose the hoop you want to jump through" to get CRT motion clarity LCD with 60 Hz. Even though it's technologically easier for LCD to eliminate motion blur at 60Hz than to eliminate motion motion blur at 120Hz. The fact that it happened first to 120Hz is simply a simultaneous happenstance of (A)+(B)+(C)+(D). Chief Blur Buster wrote: Yes, that is an option. This is really cool, your research creating practically motion blur free animation at 60fps with 480Hz really closely mirrors my research exploring the lower end Hz frequency ranges - I use the same algorithm for motion blur free animation at 7.5fps with 60 Hz, 7:1 black:visible. This is awesome, you are already approaching 1000Hz display and can extrapolate the math from the 480Hz experiments, again very cool! Agree, this should be built into LCD displays or we're left with very high resolution static images and blurry mess motion that makes us miss CRT. Great descriptions! I had a lot of trouble describing the effects of motion blur reduction even when showing examples on the Atari due to a lot of folk not having the real hardware and having had difficulties with the emulation (micro jitter, etc) that have now improved a lot. I had aslo used legacy terminology to describe, you put it in clearer more modern language that makes it easier to understand and share the ideas! That's what Blur Busters does! Most of the time, Blur Busters is between "mainstream" and "science journal", providing easy, fun, animated, annotated "Popular Science" league explanations of display phenomena. Once they discover this website, employees at monitor manufacturers have complimented that they have learned more from Blur Busters than they have from any other website. 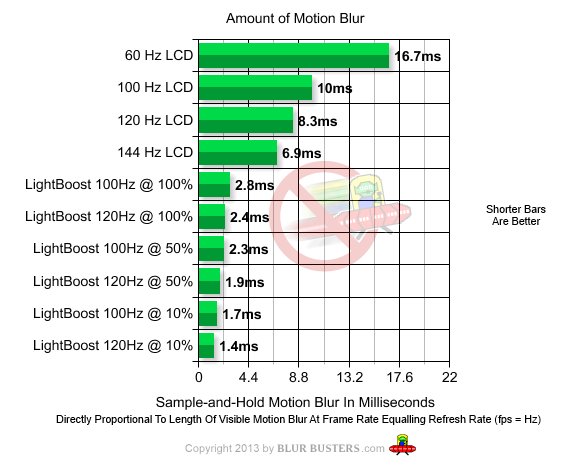 Blur Buster's "LightBoost" advocacy of 2012-2013 directly led to NVIDIA deciding to make ULMB an official feature of GSYNC monitors, and it was Blur Busters who suggested the "ULMB Pulse Width" adjustment setting. So even though most NVIDIA employees are unaware, I did push a few dominoes. Anytime you see the UFO on any website -- TomsHardware, RTINGS, TFTCentral, PCmonitors (see Reviewers Using Pursuit Camera) -- that's because they're using my inventions & the TestUFO motion tests I created myself -- and now a peer reviewed paper too -- so monitor manufacturers have noticed and tweaked their displays. Unfortunately 60Hz single-strobe is hard to advocate and get widespread. There's a lot of resistance against adding that feature. There is pressure against having 60Hz flicker. It still should be provided as an optional menu setting on gaming monitors, people do want that feature. All is not lost if one is willing to buy specific monitors. At least, we have some cool hacks/tricks/tweaks in our toolbox! Chief Blur Buster wrote: That's what Blur Busters does! I think there is (unfortunately) resistance in science to new ideas and paradigms of thought; very cool there was a peer review paper (there is resistance even in peer-review to new ideas because you initially have no peers with something new until they learn and understand) and of course the visual demonstration of the experiments makes it hard not believe your own eyes when you see much smoother animation when the blur reduction technology is in effect. Your UFO test where the scrolling background that vanishes when you look at the UFO seems similar to the effect in STARBLITZ where if you look at the ship the city goes from solid smooth scrolling to flicker. I had some more observations on analogies between your 60FPS@480Hz super smooth animation research and my 7.5FPS@60Hz research above but I didn't escape them completely (embedded within the post if you look carefully). This is awesome stuff! I'm continuing to read through your research articles and I will share this thread with the research scientists that were trying to understand the related effects in STARBLITZ and debunking them with contrived explanations.